Welcome to the Paramount Motel, the premiere destination for vacations in the Pocono area. We are centrally located near a fantastic variety of family, outdoor, and shopping experiences. Bushkill Falls, the Delaware River Valley, and over eight ski resorts are all within easy driving distance of our motel. The Paramount Motel is a family owned and operated business, dedicated to providing you a comfortable and enjoyable stay here in the beautiful Pocono Mountains. 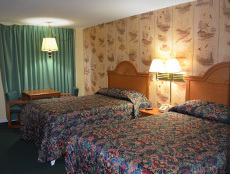 Our recently renovated motel rooms and swimming pool are sure to please and relax you. Please take a moment to review our photo gallery, the list of nearby attractions, or browse our new rooms. Feel free to contact us with any questions about our motel and the beautiful Poconos. A good place to stay. Calm & quite. i have really enjoyed my stay in the hotel. nice bed, shower, heater, TV etc the service is very good. On top of all this location in natural surroundings, good & FRIENDLY staff. I LOVE paramount pocono!! My friends and I go every year. In the past I’ve always been too afraid to go into the Motel, I would just stay in 4 star hotels. For the past two years I plucked up the courage and went in. I was not disappointed! We found this motel in Pennsylvania without any review because it is new. however, we decided to book considering good price and good location, near the town. we stayed in family room for 4 people for 2 nights. all of us are happy. the facilities provided worth the money. All in bathroom is perfect, new, clean. there is water heater for shower. we do not expect much, just the place to sleep at night as we have travailing plan all day long.